Over 50 units fully refurbished in stock with all parts and high voltage cables, warranty, ship immediately no waiting time, shop online directly. Trek high voltage power supplies and amplifiers are widely used in studying piezoelectric and ferroelectric materials for actuators, charge - discharge capacitors, performing polarization loop test, electrostatic, corona, speakers, etc. They have very stable DC output, broad bandwidth, fast response (high slew rate), serve as both power source and power sink, and very high reliability. In our lab, we have multiple Trek amplifiers made in 1990's and they are still working very well without any issue. Our engineers have compared the performance of several high voltage amplifiers, and Trek outperforms many of the other models. High voltage output cable, 15 kV, 3 ft long. For Trek 610, 609, 10/10, PZD700, 601C, etc. 4-Pin AMP input cable, one end is 4-pin AMP connector, the other end is BNC male connector, About 3 ft long coaxial cable. 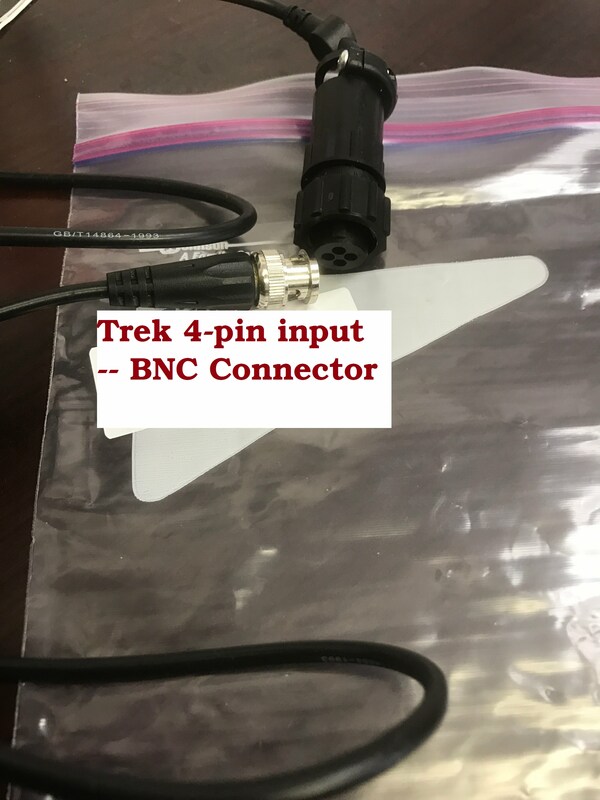 Used to connector the Trek input (model 609 and 610) to an external DC source.